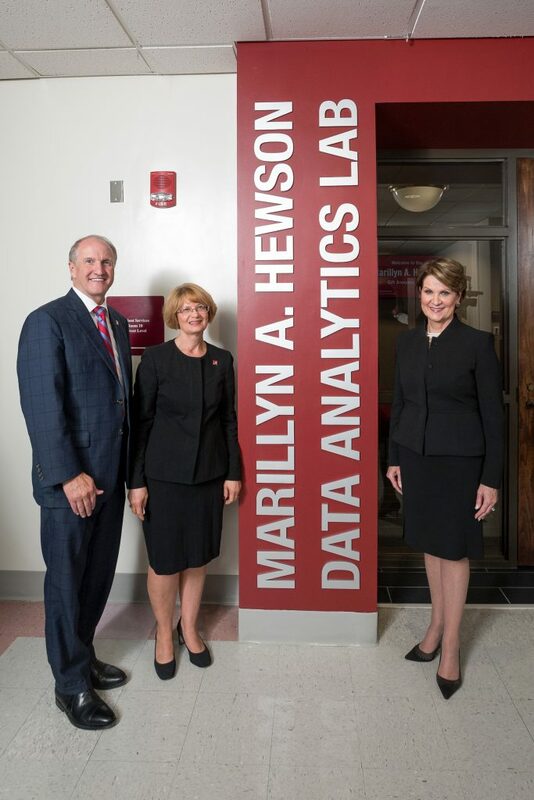 UA President Stuart R. Bell, left, Dr. Kay Palan, middle, dean of Culverhouse College of Commerce and Business Administration, and Marillyn A. Hewson stand outside a data analytics lab following the announcement of a $5 million gift from Hewson in support of the College’s education and research in business-data intelligence and cybersecurity. TUSCALOOSA, Ala. — The University of Alabama’s Culverhouse College of Commerce and Business Administration celebrated today a generous $5 million gift from Marillyn A. Hewson, chairman, president, and CEO of Lockheed Martin. The gift will support Culverhouse’s education and research in business-data intelligence and cybersecurity, specifically supporting a high-tech lab, two named faculty endowments, an endowed undergraduate scholarship and a graduate assistantship. Campus leaders on hand for the event praised Hewson and her support for the College and her impact on the University. “Marillyn’s generosity to her alma mater will sustain and promote our rigorous data-science program, enabling us to give students critical skills that are in high-demand by industry and government,” said Dr. Kay M. Palan, dean of Culverhouse. Prior to today’s unveiling ceremony in the College’s Bidgood Hall, which is the location of the lab, Hewson discussed her leadership experiences and met with several student groups. Those groups included MBA and specialized master’s students, students from the STEM Path to the MBA program, as well as College of Engineering students who have a relationship with Lockheed Martin. A graduate of The University of Alabama with a Bachelor of Science degree in business administration and a Master of Arts degree in economics, Hewson is a member of the Culverhouse College of Commerce and Business Administration’s board of visitors as well as a member of UA’s President’s Cabinet. In her more than 30 years with Lockheed Martin, she has held a series of executive positions, including president and chief operating officer and executive vice president of its Electronic Systems business area. Dr. Jason M. Parton will manage the Marillyn A. Hewson Data Analytics Lab, which is part of the College’s Institute for Business Analytics. “Through our academic programs and now the Marillyn A. Hewson Data Analytics Lab, I feel we are at the forefront of preparing our students at The University of Alabama with the proficiencies needed to apply wisdom to knowledge that will aid them throughout their career,” said Parton. “Specifically, this lab makes available unique opportunities of partnerships between academia and industry where students are involved with project-based learning that offers solutions for real world problems and therefore provides them with an experience difficult to achieve inside a classroom alone,” he said.